If you are planning a banquet, one of the first decisions you'll have to make is deciding how to let guests know about the event. 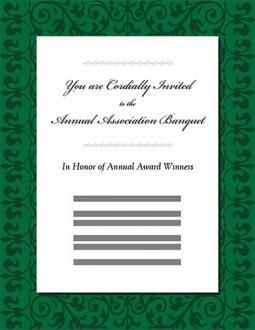 The most common way to announce an upcoming banquet is by sending a personal invitation. The design should reflect the event's level of formality and be consistent with the organization or group's overall branding message. If you'd like to print your own invitations, consider using one of the three free printable invitation designs provided here. These are upscale designs appropriate for corporate and charitable events as well as honors banquets and similar gatherings. Each design can be edited; simply click anywhere in the document and use your keyboard to adjust the text. This invitations will print as 8 1/2" X 11" flyers and can be printed on regular paper or card stock. Just click the image of the invitation that you like best and it will open in a PDF format that you can edit, save and print. If you need assistance working with the documents, view this guide to Adobe printables. If the free printable invitations don't meet your needs, there are another of other resources you may want to consider. Each of these options allows you to specify custom text for printing. Invitation Consultants: This company has an excellent selection of smaller postcard-style invitations in a variety of upscale designs. Some are similar in overall look to the printable invitations above while others have bolder graphics or are designed to look like admission tickets that you will only want to use if there is no cost to attend. Some even feature a bi-fold design. Pricing starts at $29 for 10 and goes up to around $200 for 100 invitations, depending on design. 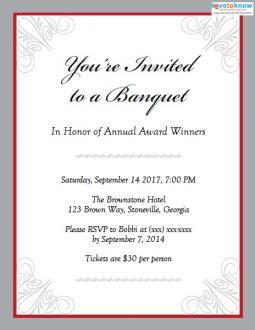 Zazzle: If you're looking for invitations that are more cute than elegant, Zazzle is a great choice. They have an excellent selection of sports theme banquet invitations, as well as styles that feature characters, seasonal designs, and special event motifs. Most are flat postcard-style designs, but some fold. Prices range from around $2 to $4 per invitation, depending on the design you select. Jo-Ann Fabric and Craft Stores: If you're a crafter and you want to send really creative banquet invitations, try following the instructions for cute do-it-yourself invitations for baseball and soccer banquets. You don't need special skills to make them, but you will need access to a Cricut machine and cartridge. The resulting invitations will probably end up hanging on attendees' walls or in their scrapbooks simply because they are so unique and special. Whatever invitations you choose, they should include details about the event's purpose, when and where it will be held, the cost, how to reserve a seat, and the deadline for making reservations. 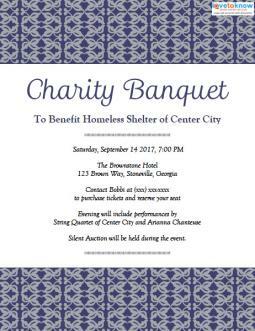 If any additional activities are planned, such as a silent auction or live music with dancing, those details should also be included. If there is a specific dress code, such as black tie, it is also important to mention that on the invitation.